Anthony Bourdain is not The Dark Knight or Iron Man, but as far as foodies like me are concerned, he's a superhero. A respected chef, best-selling author, and host of Travel Channel's No Reservations, he does what all foodies aspire to do: get paid to eat and travel. I'd hate his guts for having the best job in the world if he weren't so damned good at it. Both this program and its predecessor -- Food Network's A Cook's Tour -- are literate, well-produced shows with Bourdain as its omnipresent voice. His wit is as sharp as a Henckles, but he also gets my respect for another reason: the guy loves durian! Like many others, my dream (other than to be him) is to follow in his footsteps. No, not the TV career thing. I'm neither photogenic nor interesting enough to do that. Rather, I want to try everything he's tried: from slurping noodles at divey Southeast Asian hawker stalls, to tasting Ferran Adria's latest molecular gastronomic experiments at El Bulli in Spain. But if there was a single thing I saw on the show that made me salivate most, it was on the Indonesia episode. In Bali (see clip below), he visited a warung (see last week's post for a definition) that specialized in Balinese roasted pig or babi guling, wherein a whole hog is twirled by hand crank over an open pit of fire and basted with coconut water until the skin attains a brown, glass-like shine. "OK. No question about it. This is the best pig I've ever had. Absolutely, the best. I mean is there anything more beautiful? Do you think that even the finest French chef could ever come up with anything as delicious or as beautiful as this? I think not. It's the mountain-top of pork. And I am there." So on my trip to Indonesia a few months ago, guess what was on the top of my itinerary? Yep. Babi guling at Ibu Oka. When we arrived, it was crowded with a good blend of locals and tourists, which was odd because the restaurant is in Ubud, an artsy mountain village nowhere near the busy beach resort town of Kuta, where Hard Rock Cafe still packs 'em in. Once we found an empty table, we took our shoes off, and sat cross-legged on the floor. Lunch was easy to order, since there was really only one thing on the menu: babi guling with rice. By local standards, it was expensive. One plate? A whopping 25,000 rupiah. That's $2.73. And it was everything Bourdain said it would be. The skin shattered when I bit into it, like a brittle sheet of caramelized sugar. The pork meat itself was more neutrally flavored. Stripped into thin slabs from the carcass of the animal, I tore it up into smaller strands with my fork, and relished the pieces that was covered in their spicy potpourri of herbs and spices. The best part of the meal was something Bourdain didn't talk about -- an object I couldn't readily identify (see it on the foreground of my first photo). It was a fritter, deep-fried to a ruddy and gnarly hunk resembling porous lava rock. I don't know exactly what was in it, but there was pig involved. This I'm sure of, because it was delicious and vaguely bacon-y. So there. I finally ate where Tony Bourdain ate. One episode down. Fifty some more to go. I love Bourdain's shows as well. Have seen almost all of them. Do you suspect that he is jerk in real life? I have no basis to make that assessment, he just seems like he would be. I have a review suggestion. I am looking for the most tasty, perfect fried taco (tacos Dorados). This is not the same as a Taquito. A lot of places miss the mark by using pre fried tortillas. So far the best I have had are from Miguels (there is one in South County) and Mi Casa (even though its Americanized Mexican food). The ones at Casa Gamino on Newport Blvd next to Niuport 17 are good too. But they are so small. I hate it when mexican Restaurants skimp on portions since its one of the lowest food cost cuisines out there! Also the ones at Los Contijas (where you reviewed their fish tacos) are pretty decent. Would be nice to find it at a restaurant though that is not a sit down, full on restaurant though. Taco stand would be the best or even Taco truck. But I suggest you start at these places to see what I mean and establish a basis for your comparison. I know a place that has Tacos Dorado on their menu but I'm not sure if they're fried. BTW, it's an Orange County thing to think that authentic Mexican food can only come from a shack or a truck. I will admit it's a nice romantic notion but it's not exactly accurate. Those who have traveled more extensively throughout Mexico know that not all of Mexico is like Tijuana. The most recent season of No Reservations has been by far the best IMO, the best produced, and some of the most interesting locations. I think Bourdain is really hitting his stride with the show after a few seasons of stumbling around with too many pre-written soliloquies, silly excursions into bat guano and staged martial arts fights. And personally, I get the impression he's quite humble about how he got to be where he is but like any normal human would, can get frustrated with the attention from time to time. I suppose he also may be a bit surly and quick to find all 742 ways to pick on someone’s idiosyncrasies (as only a true career cook would) but I don't necessarily think that makes him a jerk—just colorful. Man, that pork looks amazing. The jealously is oozing from my pores. I haven't tried the tacos dorado yet, but Tacos Jalisco #2 has it and it is neither a full on sit-down or a truck. The problem is that it's in Bellflower. I think there's an O.C. outlet, too. They do make the best al pastor I've ever had. Period. AND they do menudo on the weekends. Bring your own pot or container and they'll fill it up! Damned good! I agree. The shows are definitely getting better and better. I didn't mind the martial arts thing, but the first episode out of the box (in France) was a bit too heavy on the non-food segments. Every episode since is Emmy worthy! Hi Elmo - I remember that episode as well, I even wrote the name of the place down....you are my hero....awesome! Oh wow. That is so cool that you saw that, noted it and then got to actually try it. It sounds phenomenal. Thanks for the link. That made me smile. I remember that guy! He writes hilariously. I wished that he wrote more! Deal! If we can't be Bourdain, we can at least try to eat like him! And wouldn't you know it, when I asked our driver (who we paid to drive us around for the few days we were there) if he could take us to "Warung Ibu Oka", he knew exactly where it was. On top of that he told us it was the best place to get this particular dish. Score!! Most drivers you get (if you hire a driver + car) should know where it is. Their phone number is +62 (0361) 97634. As I recall they are NOT open in the evening, late AM (11AM or so to 5PM)... For sure if you go to Bali a great lunch spot to go to one day. I was totally there, like 6 years ago...!!! I think we went there around 5ish for dinner, and they ran out of pig!!! ha ha... so we went there the next day right when they opened. Back then, I was not as big a foodie as I am now, but people keep telling me that I HAD to try it... And it was as good as everybody had described it even with the high expectation!! gaaah! why would you torment us like this Elmo! I want to try that platter so badly. That crackle of the caramelized skin. Just thinking about it makes my mouth water. Is there anywhere around irvine, or even orange county that sells anything remotely like it? If so please let me know. I've been there! I was in Bali last November and my wife's sister recommended that we try eating there. I didn't actually see the Indonesia episode of No Reservations until a few months later. I still have that saved on the DVR. The food is as great as you say it was. The next time I'm in Bali we'll probably stay in Ubud and I'll definitely be eating there again. Now... off to Warung Pojok to pick up food for probably the 5th or 6th time since I found out about it. Figures. Ibu Oka must be like the Carnegie Deli of Bali -- every cab driver knows that it's on the list places the out-of-towners wanna go. But it's ten times, no, a hundred times better than a pastrami sandwich though, IMHO. So you even beat Anthony Bourdain on this one. I was reading about Ibu Oka on another blog. It said that they go through about 4 whole pigs a day. I would've thought it'd be more. Oh boy. If there was one, I'd already be all over it. But I'll sit here hoping. I know for sure we'll never see it at Toko Rame...they're Halal. Thanks again for the Warung Pojok tip. But I agree, if I'm ever in Bali again, the first stop will be Ibu Oka. There's also an outdoor food court on Kuta Beach that has really great food for cheap. Ah, I miss it already. We ate at a really good seafood restaurant in Bali as well. I forget the name of the restaurant and the area (I believe it's just south of Kuta) but there is a whole row of restaurants where you can eat seafood at a table on the sand. We were able to bargain the cost of the food down by 40%! (In advance of course). That's something I would never think about doing... bargaining the cost of food at a restaurant. I guess in Indonesia you can bargain for almost anything. Ah yes. Jimbaran. We ate there too. On the sand. But we must have picked a bad restaurant, because it was the worst meal we had in Indonesia and the most expensive. I think we chose unwisely and also didn't bargain! I had no idea you could do that there. I think Filipinos share a lot of things in common with indonesians, culinarily speaking. From my brief experience with Indonesian cuisine (in the cafeteria located in the indonesian embassy in Makati, Philippines), I often found familiar flavors and texture that tasted like classic Filipino dishes. My favorite, gado gado, is a wonderful substitute when I had a craving for our lumpiang sariwa (mixed vegetables rolled in eggroll wrapper served without being fried with peanut sauce). By the way, I simply have to try the warung in Garden Grove for my first taste of nasi goreng after 20 years. I consider it my good luck to read about it in your blog. Yes! Lechon. That's exactly what this pig reminds me of. Also Chinese Roast Pig comes to mind. I've had lechon exactly the way at Filipino parties. There's a guy (or two) that takes orders for lechon in the So Cal area, I believe. When you try Warung Pojok, keep in mind that their nasi goreng is not a main dish. It's a side. Sort of like sinangag in silogs. Man, you weren't kidding. That marketmanila guy has some serious skillz! Thanks for the link. I think I found a new daily read! Yes! 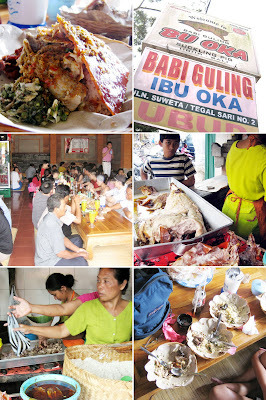 Warung Ibu Oka - ate there several times during my trips to Bali. Did you go eat at Bebek Bengil as well? Bebek Bengil? That one I completely missed. But judging what the Balinese can do to pig skin, their duck skin must be spectacular! i found that many indonesians fell in love with bourdain when he declared his undying love for this babi guling. Bourdain gets my respect of the durian thing most of all, but yes, he gets extra kudos for saying that babi guling is the best pig he's ever had. What's this deep fried thing in Singapore? I must have! I bet he was comparing it to the fried cheese he had at the Mall of America. btw, I think I know what you were wondering "The best part of the meal was something Bourdain didn't talk about -- an object I couldn't readily identify (see it on the foreground of my first photo). It was a fritter, deep-fried to a ruddy and gnarly hunk resembling porous lava rock. I don't know exactly what was in it, but there was pig involved. This I'm sure of, because it was delicious and vaguely bacon-y." that might be "glomoan" or deep fried pork fat. it is usually taken from the pork belly. or basically anywhere we can get a huge cut of fat. lol.. some other babi guling places also sell it in plastic packages. it is also sometimes used in chinese cuisine. Stopped by Bali on our way back from Shanghai. Loved Bali, especially Ubud which is a place we would come back to again and again. This is our third visit to Bali so we decided to give Ibu Oka one last chance, in view of the many superlative reviews in guide books, travel channels and magazines. Reasoning: So many cannot be wrong. But it looks like they can be. Although the meat itself which was served piping hot, was actually underwhelming but flavorful enough, the crackling was still as tough as old leather shoes! It really made my DW and me wonder whether those folks who write glowing reviews of Ibu Oka and their babi guling, including Anthony Bourdain and the travel writer from Lonely Planet have ever tasted suckling pig in a Chinese restaurant? If they have, they would have tasted exactly how good suckling pig should taste like with crackling so crispy thin that every bite is to be savored! It is highly unlikely that after that, they would ever venture to describe babi guling as amazing”, "fantastic", “best ever” and all the silly hyperbole that have come to dominate this debate and given Ibu Oka an undeserved reputation. I have nothing against Ibu Oka per se. It is the integrity of reviews that I’m concerned about! To draw an analogy, if you live in a small outpost, say in the far reaches of Siberia, you may describe your local football outfit as “amazing”, “best in the world” or whatever superlative terms you may wish to employ, not out of intellectual dishonesty, but only because you have never been exposed to the silky skills of the likes of Barcelona or Manchester United. That is probably how it is with this “amazing babi guling” nonsense! We were in Shanghai for 9 days and tried Peking Duck and suckling pig IN SEVERAL RESTAURANTS and the stuff that they served up were slices of culinary heaven! As we live in San Francisco, we have developed an affinity for the dish. We know that everyone is entitled to their opinion. But how do you judge a dish when you haven’t tasted even remotely the best? It is really like the uncultured and the philistine trying to pontificate on high-brow literature and classical music! We remain baffled over these superlative reviews, because when we compare Ibu Oka’s babi guling to the suckling pig we have tasted in Chinese Restaurants from this side of San Francisco to Melbourne to Hong Kong to Singapore and Bayswater in London, we have to say that if the Chinese version and Ibu Oka’s babi guling are compared and placed on a scale of 1-100, the Chinese version would easily place near a hundred and Ibu Oka’s would limp in below minus 10. That is the difference between a culture with 2,000 plus years of culinary development and a rank amateur! I'm a fan of Bourdain too and look forward to his witty presentations. I believe the Bali episode where Bourdain made his now famous remarks on Ibu Oka was aired in 2006/7. I watched that episode too and was just as excited about trying babi guling! I swear that I could hear the crackling as he bit into it. Could it be that Ibu Oka was that good in those days but have since let their standards drop? I find it hard to believe that any dish that had been good in 06 can deteriorate to such an extent over 5 years. The Chinese version has been around for more than 2,000 years and yet virtually every Chinese restaurant in any part of the world is able to roast it to near perfection. I’ve tried Chinese suckling pig in virtually all the corners of the world from Lima to Acapulco to Montreal to Paris to Vienna to Rio to…over 200 cities worldwide, and yet the dish has been consistently good with only a couple of exceptions! The irresistible conclusion is therefore that the crispy sound of the crackling shattering as Bourdain bit into it was probably sound effects introduced in the post production studios. On all the three occasions that we tried it the crackling was as tough as cow hide...even when piping hot! I certainly hope that Bourdain will wise up and realize that he has to get his act together. At the rate that he’s going, I fear that his credibility will soon be shot! Remember his program has caused countless of tourists to fly in from all the corners of the globe to try this babi guling in Bali only to get thoroughly disappointed! I was one of them. On reflection, however, I suppose it’s tough to be a food critic as you have to remain objective, almost counter-intuitive with our childhood conditioning to always be kind, considerate and generous. That is ok in most instances of life, but it can become albatrosses around the necks of food critics as they owe a duty to their readers to tell it like it is. 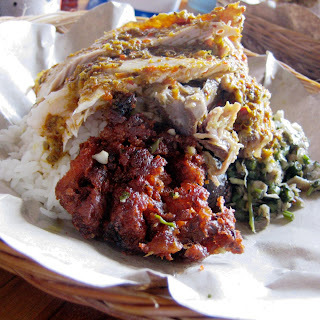 However, considering the way that babi guling has been hyped by most tourism guide books, food channels and virtually every cab driver in Bali, I guess that it is difficult not to be sucked into the vortex of ballyhoo, hoopla and puff surrounding the dish!